Utilizing web computing and Service-Oriented Architecture (SOA), Business and Scientific Workflows: A Web ServiceOriented Approach focuses on how to design, analyze, and deploy web servicebased workflows for both business and scientific applications in many areas of healthcare and biomedicine. It also discusses and presents the recent research and development results. 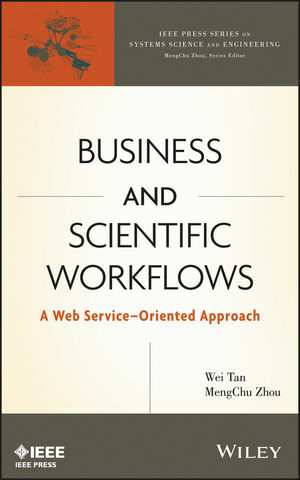 With workflow-driven service composition and reuse being a hot topic in both academia and industry, this book is ideal for researchers, engineers, scientists, professionals, and students who work on service computing, software engineering, business and scientific workflow management, the internet, and management information systems (MIS). WEI TAN, PhD, is currently a Research Staff Member at IBM's Thomas J. Watson Research Center. He received a Best Paper Award from the IEEE International Conference on Services Computing (2011), a Pacesetter Award from Argonne National Laboratory (2010), and caBIG Teamwork Award from the National Cancer Institute (2008). MENGCHU ZHOU, PhD, is a Professor of Electrical and Computer Engineering and Director of the Discrete Event Systems Laboratory at the New Jersey Institute of Technology (NJIT). He is also a Professor at The Key Laboratory of Embedded System and Service Computing, Ministry of Education, Tongji University, Shanghai, China.